Most motorcyclists hang up their helmets at the first sign of winter, but a brave few continue riding long after the temperatures drop. If you find yourself in the second category, investing in the right gear is the key to extending your riding season and making the cold weather bearable. Read on to learn the proper way to bundle up for winter motorcycle rides. Start with an athletic-style, moisture wicking base layer. Opt for a full sleeve and legging combo. Add an insulated layer to trap in heat. A fleece jacket or pullover can be a cost-effective middle layer, while down options provide added warmth at a higher price tag. Top it off with a wind-resistant, waterproof outer shell. Consider your riding habits and the typical winter weather conditions in your area to help you decide whether a full bodysuit or jacket and pants best fit your needs. While your gear should offer maximum protection from the cold, avoid bulky items or excessive layers that could interfere with your range of mobility which can directly affect your ability to control the motorcycle. If you plan to ride on a regular basis during the winter months, consider equipping your bike with hand guards or heated grips to better protect your fingers from the icy winds. Winter weather can present some dangerous and unexpected obstacles even if you’re properly suited up for the conditions. If there’s even a small chance of snow or ice or the wind chill is expected to drop, it’s best to save the riding for another day. 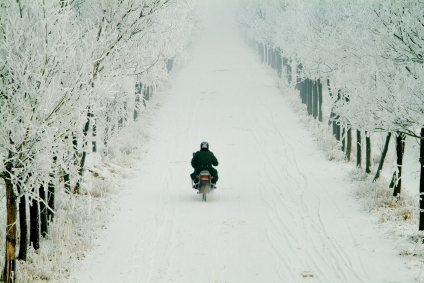 Do you brave the cold to ride your motorcycle through the winter months? Share your best tips and gear suggestions in the comments.